The Macedonian startup Macedonian Honey has been recognized as the best startup in Europe in the Climate category. , has the aim of improving the sustainability of the ecosystem and its biodiversity, which would represent an impulse to slow down the effects of climate change. The Macedonian startup Macedonian Honey has been recognised as the best European startup in the Climate category at StartUp Europe Awards (SEUA), an initiative of the European Commission and the Finnova Foundation in collaboration with Startup Europe. After going through several stages and being chosen to represent Macedonia in this category, Commissioner for Society and Digital Economy Mariya Gabriel handled to Macedonian Honey the diploma that accredits them as European winner during the Startup Europe Summit 2018 hold in Sofia, in the presence of Prime Minister of Bulgaria, Boyko Borissov and several European prime ministers and ministers. In her speech, Commissioner Gabriel congratulated Macedonian Honey and the rest of the European winners and encouraged them to continue working hardly as they have been doing until now. "Europe wants to have more like you. More of your passion, dedication, talent and energy. We believe in your dream and you have already showcased that progress is made with small steps, and that to become successful it takes a long nights and serious thinking on how to approach the most challenging topics. You showcased that success can come from anywhere in Europe. And you showcased that in order to succeed you must be bold and brave", she expressed. “This award give us an additional strength to continue with our work, to improve ourselves, to seek for perfection and never give up. This award is not for us only; it is an acknowledgment for Macedonia, as small country, but with recognizable practices in fighting bee decline, climate and boosting biodiversity, as the best in Europe. 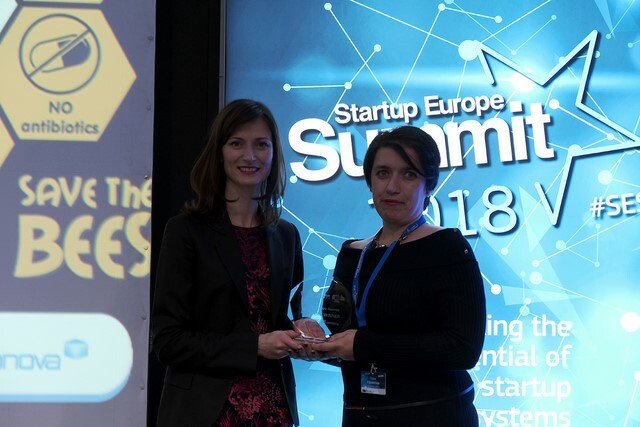 Thank you to Startup Europe, Finnova and its director Јuan Manuel Ravuelta Perez in recognizing our efforts” says Elena Fidanoska owner of Macedonian Honey. StartUp Europe Awards proposes an open innovation methodology through public-private partnerships, "which works to help public entities to find a solution to their local challenges, and also to help startups by testing their innovations on pilots supported with European Union funding" said Juan Manuel Revuelta, director of the StartUp Europe Accelerator at the Finnova Foundation. Macedonian Honey and the other European winners of the StartUp Europe Awards will gain visibility thanks to the Media Partner Alliance, made up of 25 members from Spain, France, Belgium, Latvia, Luxembourg, Italy, Slovenia, Croatia, Cyprus, Ireland, Sweden, Mexico, Norway and Denmark, among others. Startups will also have access to a mentoring programme (in internationalisation, European funds such as the €50,000 to €2.5 million non-reimbursable grant SME Facility, international communication, etc. ), through the Finnova Foundation's StartUp Europe Accelerator, which will enable them to boost their projects and make them more viable worldwide. “We have created a new way of beekeeping and invented a new hive- Elle-Hive™. Everything that conforms to the natural habits of bees and make it easier for the beekeeper. Our work resulting in stronger bees with strong genetic material that provide future bee generations easily to deal with predators and climate changes. We are working on conservation of honeybees, improve the sustainability of ecosystem and its biodiversity, an impulse to slow down the effects of climate change”.